Actual trading and back testing the earlier years produced the following results for Fidelity Timer vs. the S&P 500. 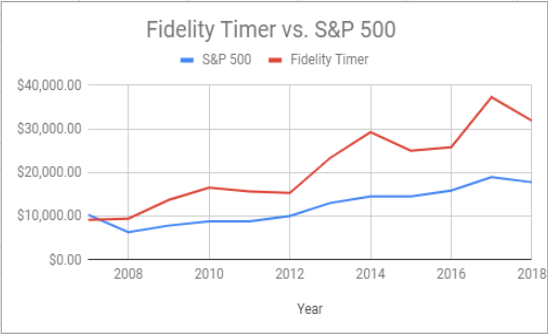 Total Fidelity Timer return for the twelve year period was a gain of 218.88% compared to a gain of 77.90% for the S&P 500. Fidelity Timer is a conservative approach to investing. This system switches between ETF ProShares Ultra S&P 500 (SSO) and a cash equivalent when there is a major change in the markets direction. _Sign Up Now It's FREE for the first two months. _Subscribers receive an email every Friday advising whether to hold ETF ProShares Ultra S&P 500 (SSO) or switch to a cash equivalent. __Free 60 day trial to Fidelity Timer - If you choose to continue to receive this service, you will only be charged $10 a month (much less than a daily cup of coffee). Cancel at any time if not completely satisfied and receive a full refund for the unused portion. You risk nothing. _Copyright ©2019 TM Lester Co. All rights reserved.